Stop RFID Theft from Today! SAFETY PRIVACY SECURITY: UTO Credit Card Wallet is Equipped with Advanced RFID SECURE Technology, Protect Your Valuable Data, Block RFID Readers from Scanning Your Credit cards, Debit cards, Banking Information, Smartcards, RFID Driver's Licenses and other RFID Cards. Soft synthetic leather with snap closure design, safe and easy to use. Smooth silver color zipper and detailed streamlined stiching. 19 card slots, including 1 clear plastic ID slot. 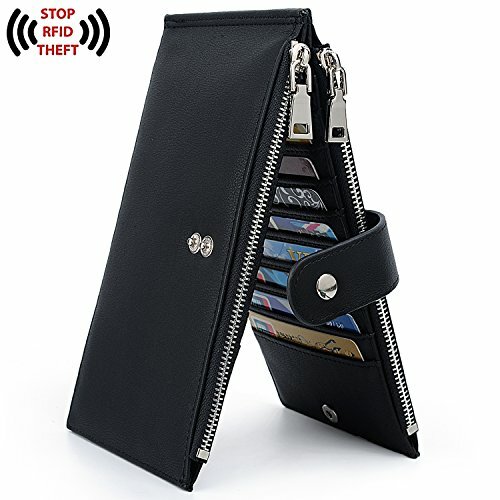 2 full-length zipper pockets for cash and mobile cell phone. Dimensions: 7.67"L x 0.59"W x 4.13"H.